911_02, originally uploaded by Kadath. 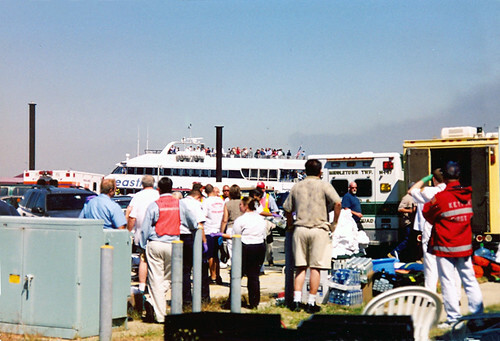 "EMS and fire crews in Highlands help those returning to NJ from the horrors of the Twin Towers falling. Dust covered everyone getting off the ship and the crews helped clean them up as best they could. My father ran the cleanup in Atlantic Highlands, I tried to help but there was nothing to do for me but to wait for a call to action that never came." This is one of the 4 photos I shot on 9-11-2001. The world was a blur that day and I did not have the presence of mind to document it better. I went to Highlands to see if I could help with the people coming in off the boats, I was not able to help so I went and just sat in Navesink Firehouse waiting for a call to help somewhere, anywhere but there was nothing for us to do but sit, and wait, and watch the dreadful replays on TV over and over. Today it seems like a distant memory, a bad dream and yet still so important to the state of the world and important to never forget. NJ lost so many people in the attack, Middletown in particular lost more than its share due to many people commuting in to the city from here. Somehow I was 'lucky' to only know one person who died personally. Kenneth Tietjen was a classmate who died serving in the Port Authority. Ken and I werent close but I always thought he was a cool guy, a smartass with an easy smile and a devious mind. I was surprised to hear that he had gone into law enforcement but I bet he didn't stop the wisecracks there either. As time moves on I worry that we forget the lessons of that day along with the memories of the people who died. I'm not a political person but I do give a lot of thought to how we treat the world and how the worlds sees us, and I don't think we have done well on that score. I also think the security precautions we have put in place are silly props designed to stop the last attack and not think about the next one. That, tho, I guess is an essay for another day.